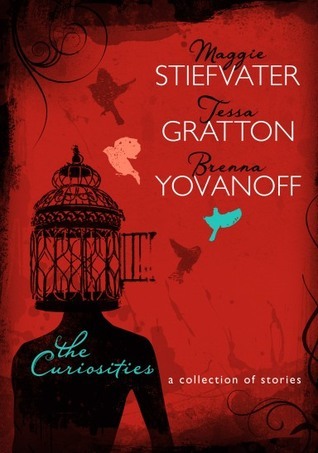 The Curiosities is a group of short stories from Maggie Stiefvater, Tessa Gratton and Brenna Yovanoff, who are critique partners. These stories were originally posted on their website The Merry Sisters of Fate. I have to admit I never read the stories posted online. I can’t stand reading on my computer, it makes my eyes hurt and I always find myself getting distracted (the internets a big place). So I was very excited to read these stories in print form especially since Maggie is one of my favorite authors. The best part about this collection wasn’t the stories themselves it was the doodles, notes in the margins, and introductions to the stories that each of the authors made. It gave insight in to their writing styles, how they evolved as writers, and tips and tricks for improving your own story. It also gives you an idea of how their critique partnership works and has evolved. My favorite Maggie story is a toss up between “The Last Day of Spring” and “Another Sun”. The two stories were very different but both had a bittersweet feel to them and I loved them both in completely different ways. My favorite Brenna story is “The Vampire Box”. It was the first story in the anthology and it got me interested in Brenna’s other works. It is about a vampire who lives in the basement of a girl’s house. Originally, I was a bit worried about the Brenna stories. I read The Replacement and while it was well written it wasn’t my thing. I should not have been worried though, many of my favorite stories in this collection were written by Brenna! My favorite Tessa story is “Date With A Dragon Slayer”. It is about a girl who wins a date with a dragon slayer and the strange conversation they have the night before he goes out to slay the beast. I loved the open ending and would have liked to read even more from this world. Overall, there were some stories I absolutely loved and others I didn’t care for. I am glad I read this collection of stories though. It gave valuable insight in to each authors writing process and the drawings in the margins were a fun touch. I also enjoyed the banter between Maggie, Brenna and Tessa.